The last time Congress enacted substantial tax reform-in 1986-only 8.2% of American households owned personal computers. Today, more than 87% of American adults own a mobile phone and on-demand platforms like Uber, Etsy, Lyft, Airbnb, HomeAway, Amazon, and TaskRabbit have become household names by connecting businesses and consumers. 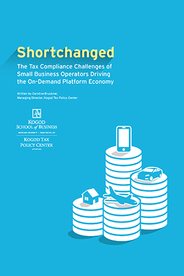 Although millions of Americans are engaging in the on-demand platform economy every day as sellers and service providers, the tax compliance challenges this new frontier presents have gone relatively unnoticed. At the same time, these challenges will grow with this fastest growing segment of the labor economy- creating unnecessary and ongoing burdens for the small business operators who power the on-demand economy. More than 2.5 million U.S. taxpayers are participating in the on-demand platform economy as small business owners every year, and that number is set to more than double in the next few years. At best, these small business owners are shortchanged when filing their taxes; at worst, they fail to file altogether. In addition, these taxpayers face potential audit and penalty exposure for failure to comply with filing rules that are triggered by relatively low amounts of earned income and inconsistent reporting rule adoption. The current tax administration system isn't working for a significant percentage of these small business taxpayers or Treasury or IRS. The existing tax rules effectively create a $19,399 reporting tax loophole impacting millions of taxpayers (the difference between the income thresholds triggering Forms 1099-K and 1099-MISC reporting), resulting in widespread confusion among taxpayers. The current state of play is one of unnecessary burden, potential audit and penalty exposure for on-demand platform economy players. We can do better. Download the full report in PDF form here. Download Caroline Bruckner's full testimony in PDF form here.